Happy sort-of-fall, everyone! I spent my summer vacation counting the Instagram bra ads that I still can’t get rid of, and also reading Naomi Wolf’s The Beauty Myth, the classic early-nineties accounting of how evolving beauty standards are damaging women. Seems fun, right? She looks as though a strong gale would snap her in two …. what better symbol to reassure the establishment? …. By simply dropping the official weight one stone below most women’s natural level, and redefining a woman’s shape as ‘too fat,’ a wave of self-hatred swept over First World women, and a major industry was born. It suavely countered the historical groundswell of female success with a mass conviction of female failure, a failure defined as implicit in womanhood itself. But it’s not just weight loss “solutions” that are distracting us. A quick peek around Instagram and the larger Web reveals a wide variety of body preoccupations. No part is spared, and no appearance is the correct one: women are trying to get more muscular, and also thinner. Trying to get rounder butts and smaller butts. Bigger hair and calmer hair. There are products to whittle your eyebrows down, and then more products to paint in what’s left to ensure they stand out. All of it began to feel absurd to me, so I did what I do when things feel absurd: I coded something that mimics the absurdity. The new project is called Problem Bodies and you can play with it starting today. 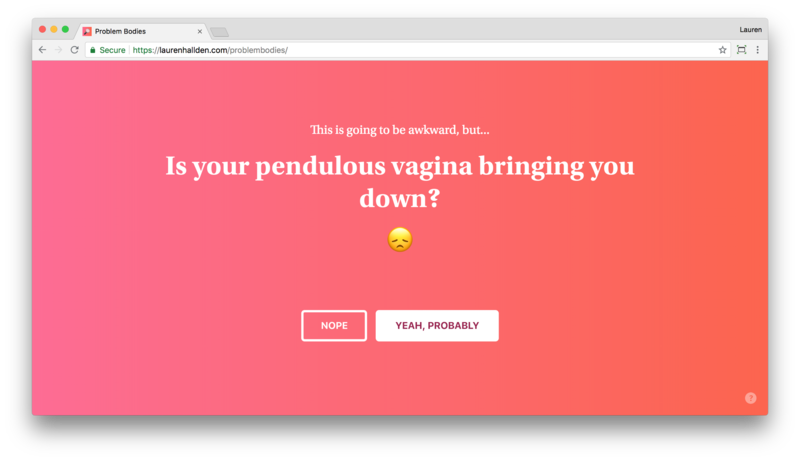 Problem Bodies is a site that randomly generates things that are wrong with how you look. If you agree with it, it’ll try to sell you a solution. If you disagree with it, sometimes it will argue with you. Don’t worry, men; you haven’t been spared. There’s something in there for you to feel bad about, too. One thing it does not do: tell anyone to change the color of any body part. I know this happens in real life — people are certainly told to lighten their skin or their hair (or conversely, to go tanning, at great risk to their health), and women have even been encouraged to dye their vulvas pinker (gotta keep that youthful glow!) — but even if it’s our reality, I couldn’t create a website that’s Russian-roulette racist. A hilariously horrible thing I’ve realized while working on this project: some of these products are real. 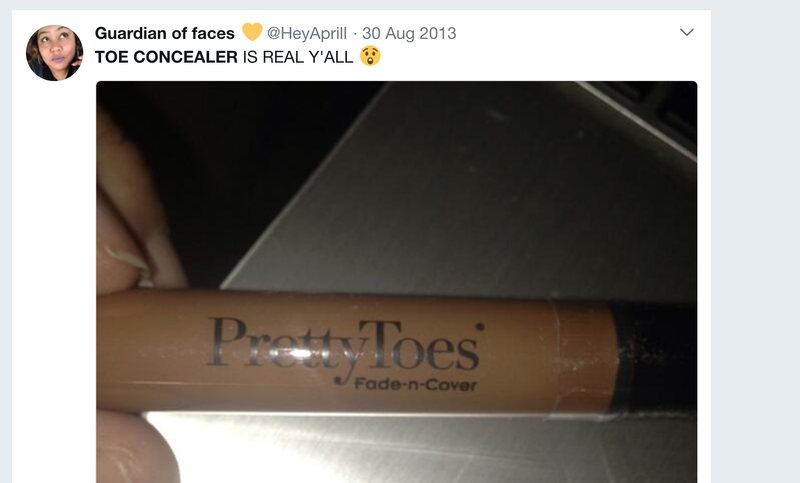 Problem Bodies will mimic advertisers by occasionally suggesting you join a social media community of other people who, for example, love their Natural Shrinking Toe Concealer. It will generate a link for you. And sometimes that link totally works. Ready to take it for a spin? Get your body problems diagnosed here.